Teddy was imported in 2008. 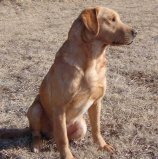 Teddy is a wonderful working dog who was run in several Open stakes in the UK before being Imported into the USA. In these Open stakes, Teddy had 2-Open Field Trial Wins, 2-Open field Trial 2nd's, & 1-Open Field Trial 3rd. 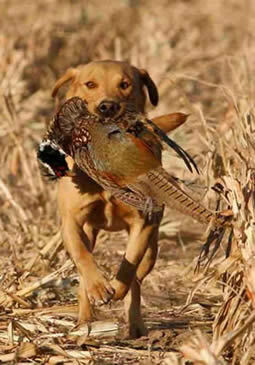 Teddy is now kept busy each fall duck and pheasant hunting. Living the good life. Teddy's confirmation is excellent, with a very attractive square head, broad chest, and extremely muscular feature's. Making him an excellent example of a properly bred British Field lab. Teddy is a very well behaved, true gentleman, with a nice thick Fox Red coat, and the classic "otter tail". His weight is 62 lbs. Teddy's drive is as hard on blinds, as it is on marks, over land or water. When he was on the British field trial circuit, he was known primarily for his Drive, and gamefinding abilities. It's hard to believe a dog with this much drive can turn it off. But Teddy can.